Professor Dymytrii Bazyka's research covers the wide-ranging areas of radiation biology, epidemiology, immunology, and radiation protection. Following his pursuit of international joint research efforts he was also the first person in the world to report the high frequency of RET proto-oncogene rearrangements in the dramatically rising incidence of thyroid cancers resulting from the Chernobyl accident, in addition to which he had led epidemiological and molecular biological research into radiation-induced thyroid cancer. Moreover, he has enthusiastically participated in numerous international projects over the space of many years, and his Institute manages radiation-induced thyroid cancer biospecimens as Ukraine's representative body in the Chernobyl Tissue Bank (CTB) of the World Health Organization (WHO). 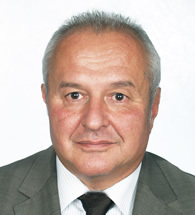 Professor Bazyka participated as a medical consultant in the medical treatment of radiation-exposed staff of the Ministry of the Interior immediately following the Chernobyl accident in April 1986, and started his research into radiation exposure at the National Research Center for Radiation Medicine, National Academy of Medical Sciences of Ukraine. In May 1987 he subsequently launched research, working as a senior scientific officer in the Laboratory of Clinical Immunology, into cellular immunity and the treatment of immune deficiencies in the radiation-exposed. In 1989 he enlarged his studies to include flow cytometry. In addition, from 1989 to 1996, he worked on research into the treatment of exposed clean-up workers and staff from inside the 30-km exclusion zone around the Chernobyl plant, as well as children from Kyiv and Slavutych, who were affected with acute radiation syndrome due to radiation exposure. Since 1996, Professor Bazyka has been working on the diagnosis of radiation-induced leukemia and myelodysplastic syndromes, and researching ways of treating and reducing the side effects of these illnesses. On the international stage, Professor Bazyka has participated in UNSCEAR (The United Nations Scientific Committee on the Effects of Atomic Radiation) since 2008, and been the representative for Ukraine since 2011. Ever since the Chernobyl accident he has devoted his energies to the medical treatment of those exposed to radiation, and research into the effects of radiation upon human health. He has made a vital contribution to the study of the molecular mechanisms of the cellular effects at the early and remote periods of low-dose irradiation. Professor Bazyka has also left an outstanding legacy of research work on the medical treatment of secondary immunologic deficiencies and hematological health effects suffered by residents of the contaminated areas around Chernobyl. Professor Bazyka has been highly evaluated on the grounds of all the above activities, and thus selected as the recipient for this time's prize.